The Balinese celebrate the advent of the new year in a very idiosyncratic manner: After a night spent on avid celebrations and festive marches, they close themselves in their homes and refrain from working, traveling, as well as making loud noises and using lights and electricity. If you would like to learn more about Nyepi, read my article exploring the „Day of Silence“ from the perspective of acoustic ecology. At first sight, the South-America-shaped (or heart-shaped for the romantically-inclined or lovers on honeymoon) Vietnamese island located close to the border between Vietnam and Cambodia, Phu Quoc, nearly fits the image of the perfect holiday destination. With its virgin white sand beaches, red clay dirt roads, lovely hills, magnificent waterfalls and mushroom-cap islands, the island may truly strike you as a paradise at first. However, beneath all this, or rather, on top of all this, looms the threat of development in the form of incessant construction, which is hastily transforming the island into a concrete fortress and one of Vietnam’s major tourist destinations. However, the din and rattle of excavators, other heavy machinery as well as electric grinders and other pervasive noise-makers has its place in the island’s soundscape these days just as the sounds of swashing waves, chirping cicadas and singing birds. Aural perception does possess one advantage over visual perception: One can close one’s eyes, thus blocking any visual impetuses encroaching on the eye and fully immerse oneself in the sonic events surrounding oneself, be they the result of natural phenomena or of man’s actions and creations. We have trained our eyes so as to draw as much information from our sight as possible, whereas ears, when they are not occupied by listening and comprehending what others are telling us or warning us of imminent danger, can be fully devoted to sonic beauty. Nevertheless, this requires a certain perceptive shift in one's hearing and often sacrificing other people's company and spending a lot of time on your own. But first things first, my initial notable sonic experience on the island was that of the sea as heard from the shore by the Bamboo Cottages in the northwestern part of the island which was my home for the first three nights on the island. The waves were beating the shore with such intensity that their massive gushing seemed to swallow all other sounds on the shore. And what brought even more joy to my ears was the peculiar sound of waves lapping against the nearby pier and splashing over it, reminding me of a whale blowing off air from its blowhole. I chose bicycle as the first means of getting around on the island, which, even though it did not permit me to scale long distances, proved to be a good enough companion on dirt roads and permitted me to explore the northwestern part of the island in more detail. As I was cycling along the coast I started to notice two recurring, but starkly contrasting features in the landscape: pools of stagnant water almost, but not quite, stretching to the sea very much like rivers, which are slowly drying up, and rampant development of monstrous buildings and asphalt roads connecting them to one another. After meeting the dead end of the road – the fence of one of these concrete nightmares dubiously called VinOasis, I turned my back to the sea and soon found myself surrounded by the rattle of construction (or was it destruction?) which could be distinctly heard from several directions. As if to round off the dystopian, theme-park like impression of this spectacle, an actual theme park called Vinpearl emerged right next to the hotel! On the way back to Bamboo Cottages I took a road which was under construction just as it was being levelled by an excavator. The crickets in the background provided nice ambient sound to the puffing and clattering sounds of the machine. My second day on the island started very much the same as the first one with morning yoga in a lovely grove with rustling leaves and the background hiss of the waves on the adjecent beach. After a delicious breakfast I gathered my gear, hopped on the bike and decided to venture in the opposite direction than the day before - to the south. After having passed a couple of beautiful beaches and surmounted several hills, I crossed a river and arrived to a small fishing village with seafood restaurants, street food vendors’ stalls and an unsually loud schoolground where children were having some sort of cooking competition. The endearing commotion with loud RnB music blasting out of the loudspeakers notoriously known from Vietnamese home karaoke rigs could not be left unrecorded. Now, having experienced some of the land- and soundscapes in the northeastern part of the island from a micro perspective, I decided to move all the way to the south to a homestay in the harbour town An Thoi, the gate to several small islands now connected with the mainland by a giant funiculare which is about to open anytime. However, I decided to stay loyal to the land and explore the mainland instead of sailing on fisherman's boats with other tourists longing for retreats into the exotic. Since renting a motorbike turned out to be unavoidable in order to explore places beyond my actual vicinity, I rented one for two days and I was thus all set to circle the entire island. Being drawn by the dense vegetation and the majestic hills of the Phu Quoc National Park in the north-east, I set the course towards the north again, yet this time I drove along the eastern coast. Despite being a bit of a bumpy ride as the major part of the eastern seaside road was still under construction, it offered amazing views of both the sea on the right and the mountains on the left. Just as I got on the newly built firm asphalt road, I made a wrong turn, passed under a Roman aquaduct-like arch where the road ended and suddenly found myself on a magical glade. Here, the sound of rustling leaves with birds twittering in the trees and cicadas chirping in the background made for an idyllic soundscape which provided atmosphere to the quiet solitude of the stately romantic ruins. From there, I decided to go all the way to the north to the Rach Tram beach, still riding on dirt roads whose condition was steadily worsening. Yet my determination was soon to be rewarded by a fascinating discovery: a massive disused old rusty water tank left by the road. It was probably left here by the road construction workers and since then, it has accrued rust all over its body and blended in, at least in terms of colour, with its natural surroundings. I walked around it in fascination and tested its sound by hitting it with my open palm which produced a massive deep wham with a monumental, almost a cathedral-like echo. I spent a good hour by the reservoir, climbing up and down the oval structure while testing different microphone set-ups in an effort to get as much variety of sound as possible from it. Time passed as locals drove by on motorbikes and cast incomprehensible glances at me, but I was so immersed in the listening experience that I barely paid any attention to them. With the soft chirping of crickets in the background, these recordings may seem as a drastic intrusion into the tropical soundscape, but if you free yourself of the common preconception of man-made noise being in sharp contrast to the peaceful sounds of nature and listen to them simultaneously as they appear on the recordings with an open mind, you will surely discover that they blend into each other with such commonplace beauty. Slightly belated by my unexpected recording session, I finally made it to the Rach Tram beach and was excited to realize I was the only visitor there! I took a dip in the sea and reveled in the peacefully harmonious view of the beach and the sea with boats gently rocking on it. From there, I managed to make it all the way to the west to the village of Gành Dầu to catch the sunset from a seafood restaurant by the sea. But from there, it was still a 1,5 hour ride to my guesthouse! I arrived to An Thoi around 10 pm freezing from strong wind on the road and utterly exhausted, but still feeling excitement from all the amazing things I experienced that day. On the following day, I got up a bit later, bought some fruit for breakfast and ate it on the terrace of my guesthouse as I drank Vietnamese coffee, which the owner prepared for me, and observed the hustle and bustle on the street below. At 10:30 from the school right across the street, screaming children started pouring out for the main break which started by a short physical exercise accompanied children pop song. As I was watching this endearing spectacle, I started to make a plan for the day. At the very top of my list was Ho Quoc, the largest Buddhist pagoda on the island which I did not manage to squeeze in the previous day. What I find so enthralling about Buddhist temples is the absolute serenity surrounding their grounds disturbed only by the occasional hubbub of tourists, and the inner peace of mind that the visual and sonic experience of these places mutually bestows upon you. And this was exactly the case of Ho Quoc, a stately temple with several pavillions and a statue of Buddha perched on a hill facing the blue infinity of the sea. Nevertheless, as I was approaching the temple compound, my heart started throbbing with excitement since I could already hear the tubular bells from one of the bell towers. Propelled by the changing gusts of wind moving the iron leaf in the middle, thus setting the round iron plate in motion which reverberated the bells, the graceful tones created a neverending automatic composition (without any effort on the part of man despite the initial task of their actual creation) whether anyone listened to it or not. It was precisely this lack of human agency that attracted John Cage to zenbuddhism in the first place. I sat down on the second floor of the tower, closed my eyes and immersed myself in the cosmic composition flowing in sudden crescendos and decrescendos with the changing intensity of the wind. My composure was interrupted only by the high-pitched voices of children and by the creaking sounds of their footsteps as they ascended above on the steep wooden stairs above, but I did not mind them at first as they added a bit of realism to the temple soundscape. But my patience was not infinite. 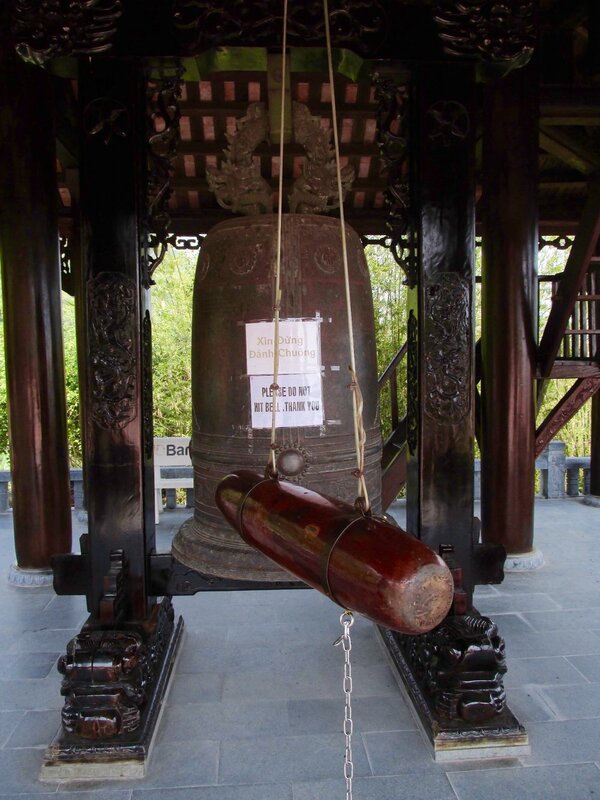 As seen on the picture above, each of the bell towers had a large suspended bell or a drum in the ground floor bearing the sign asking the visitors to abstain from hitting these objects. However, the desire of some of the visitors (mainly children) to do so turned out to be stronger than their self-restraint and once one person started, others soon followed up and what was originally a serene and meditative sound environment turned into a clamouring contest of “Who can hit the drum louder?” Compared to the shrieking voices and the growing commotion, the construction works carried out on the foundations of the Buddha statue overlooking the temple and the sea were a pleasant experience for the ears. To distance myself for a while from the crowds and quench my thirst for sounds of nature, I decided to venture to the central part of the island below the national park to take the hike to the Da Ban stream. Right after I arrived to the visitors' centre, which was rather a small restaurant with several hammocks for the employees to chill on, I paid a small fee and then crossed a magnificently creaking footbridge to the other side where the hike started. Since I always enjoy getting off the beaten path, I soon got off the main trail and soon found myself surrounded by trunks of trees which were all wrapped up in plastic! The spectacle almost reminded me of some provocative art installation, but unfortunately, this was a real plastic rainforest! As I waded through the dense growth encumbered by plastic bags filled with water which resembled parasites sucking the trees' life power, I wondered where all this plastic came from. I was soon to find out. 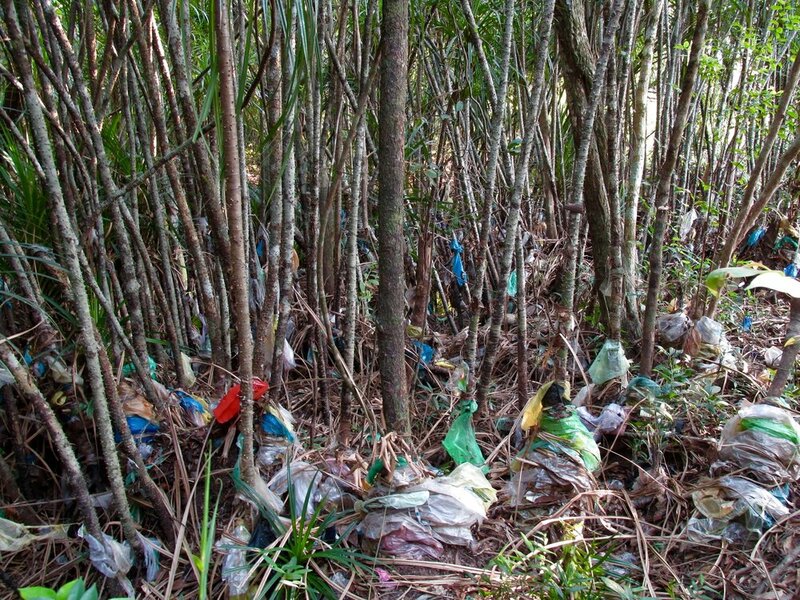 Then I started to notice abandoned campfire sites along the rocky stream bed surrounded by discarded plastic bags, cigarette buts and beer cans spread around them – and soon to follow were the perpetrators of these trash islands – small groups of Vietnamese picnicking, drinking beer and setting up a campfire. I was offered a beer from one of them and having just seen the mayhem produced by disposable packaging and the indifference with which they treated the environment, I was reluctant to accept it, but eventually gave in and accepted the gift - after all, it was a free beer! Needless to say, after having drunk it, I put it in my backpack and I threw it away afterwards in a litter bin at the visitors' centre. I ascended further towards the stream and gradually the walk became more and more interesting since I had to climb over boulders and rocks between which water gurgled and formed pools of water of various sizes. As I sat between the boulders, I tried to move my head closer to the crevices between the stones so that my ears (and eventually my microphones) could capture to the fullest the sounds of flowing water which beautifully reverberated between them. And like manna from heaven, a nearby frog enlivened the recording by its creaking solo. On my way back to An Thoi, I stopped at Duong Dong, the largest city on the island, to witness the famous local nightmarket with lots of delicacies (a large selection of seafood from sea urchins to huge groupers still swimming in aquaria) and local produce for sale, especially pepper and honey. It was quite a spectacle, but I soon got discouraged by the the swarms of tourists there and decided to return to the picturesque harbour town in the south where I was staying. Once I got there, I decided to go for a short walk and was lucky to overhear sounds of bells coming from a nearby Buddhist temple. On my last day in An Thoi I wanted to visit the harbour and experience its busy traffic - fishermen returning with their morning catch, the loading and offloading of freight etc. Therefore, after breakfast, I checked out of my guesthouse, grabbed my backpack and set out towards the harbour site which was just a short walk away. I took a tiny side street where I could hear one of Erik Satie's Gymnopédie pieces playing from one window, which perfectly matched the lazy atmosphere of that beautiful sunny day at that very moment. From the street, I got to the harbour area where I could revel in the views of the sea as I walked on the jetty and listened to the sounds of waves hitting the bulwarks, which, similarly to the waves at Bamboo cottages seemed to resemble sounds produced by animals, just this time, it was a loudly sniffing dog. So it happened that my last sonic experience of Phu Quoc was very much akin to the first noticeable sound I heard there, which was similarly produced by the motion of sea, whose myriad shapes will never stop to fascinate me. I was lucky enough to see and hear Phu Quoc in the midst of transformation – one that, after it is completed, is bound to dramatically increase the ambient noise level of this island. However, the current soundscape of the island in which the sounds of human and machinery often superimpose or blend in with the sounds of nature, is by no means horrific, quite the opposite, it brings sound expression to its fullest potential, one in which clashing frequencies, varying oscillations and contrasting timbres leave an immensely strong impression on the ear and leave an unforgettable trace in our memory. Merely a 40 minute boat ride from the Manado harbour, the Bunaken island in Northern Sulawesi located barely one degree above the equator is first and foremost known due to its rich variety of marine species which inhabit the coral reefs surrounding the island. Therefore, it is no surprise that the island, which is the home to Bunaken National Park and many diverse marine species attracts mainly divers, which was, incidentally, the reason that brought me here as well. Among its terrestrial inhabitants are – apart from humans – various tropical plants and small tropical animal species (mainly birds, geckos and insects) as well as domestic animals. There are three villages on the island which are connected by paved and dirt roads. These are frequented by locals on their motorbikes, which are, along with diesel generators and boat engines the sole human noise generating sources penetrating the tropical rainforest soundscape with singing birds, particularly loud chirping crickets and other fascinating sonic phenomena. The crickets are especially worth listening to – they outmatched by the loudness and intensity of their clatter all the other members of their species I had ever heard before. Houses with corrugated roofs and small husbandries are spread out sparely along the main road. So if you are patient enough and wait for the moment between the approaching and departing motorcycle, you can cherish the everyday rural sonic activities surrounding these dwellings: clucking chickens, crowing roosters, snorting pigs – all those amidst the sonic background of a tropical rainforest soundscape. When I made it to the village, it was already dark and majority of the sonic activity moved from the streets to the porches of houses and a couple of small warungs as the locals and visitors centered around them, chatting, eating their dinners, some playing guitars and singing. Nevertheless, the church on the main street presented me with a little sonic treat: a congregation of squibbling birds on its roof resembling a Christian convention. On the way back, I grabbed a beer in a cozy bar and sat down to listen to a band playing reggae covers and endearing folk songs. With no hydrophone included in my gear, recording underwater sounds still remains a challenge to be tackled in the future. In any case, the tropical-rural soundscape of above-water Bunaken with its stark sonic contrasts turned out to reflect quite peculiarly the rich diversity of marine species here dwelling underwater. A trailblazing collection of essays written by a piano virtuoso and an author with a searing analytical gift, which will disclose to you a plethorea of truths, half-thruths and illusions from the world of classical music as well as the pitfalls of performing the classical piano repertoire from Mozart to Schoenberg. I worked on the translation of the book with Tomáš Jajtner. It was published by Volvox Globator and can be purchased on the website of the publishing house or on the site of internet bookshop Kosmas. The English original was published by Robson Press.